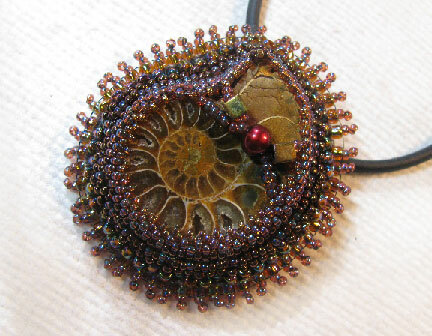 Beading Arts: A couple more bead embroidery pendants...tutorials to follow! 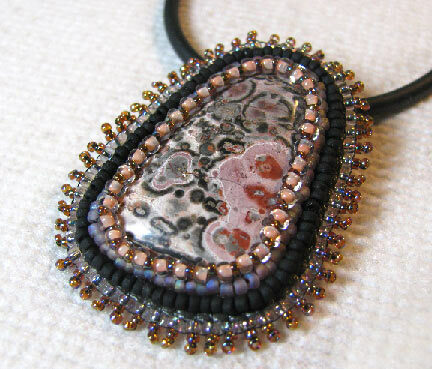 A couple more bead embroidery pendants...tutorials to follow! Every day that the temperature gets lower, I get closer to stitching larger bead embroidery projects! This was one of the hottest and most miserable summers that I can ever remember, and so far, I've only done a few smaller pendants. Here are the next two, and I hope that shortly I will have some tutorials for you. In the meantime, please take a look at all the bead embroidery tutorials at the link! Cyndi, I really like the first piece you showed on this post!!!! Really a unique stone and the beading around it is wonderful! I might have to look at some of my stones I have in a different way!! Thanks Robbie! I don't think you can really tell from the photo, but the top point uses that same herringbone stitch that I showed in the square tutorial last week.